Until recently, I was under the impression that the link between ‘gluten-free’ and flavour was strictly forbidden. Over the Summer I took part in a six-week low FODMAP research diet, completely eliminating gluten (amongst other things) from my day-to-day life. Unsurprisingly, this turned out to be very difficult when visiting restaurants and after four weeks the overbearing cravings for food with even the slightest hint of excitement became impossible to resist and the diet was left incomplete. The problem was not with the dietary restrictions, but with the frankly disgusting readily available ‘gluten-free’ produce that has begun to line the shelves of so many supermarkets in recent years. Because, let’s face it – who really has time to bake their own bread, and to make their own snacks and pastry with specialist ingredients at home, just for the hell of it? Bread that tastes as though it passed its expiry date sometime before I was born, biscuits and cakes drier than the Sahara, and pasta that texturally resembles wet cardboard. If anything, the diet made me feel lucky that I’m not one of those with a genuine allergy or intolerance, forced to stomach this horrendous food indefinitely. Yet surely not all food that’s free from gluten needs to be completely free from flavour, too? After opening his first solo restaurant – M – off of Threadneedle Street at the beginning of last year, ex-Gaucho Managing Director Martin Williams has opened another huge space near Victoria. 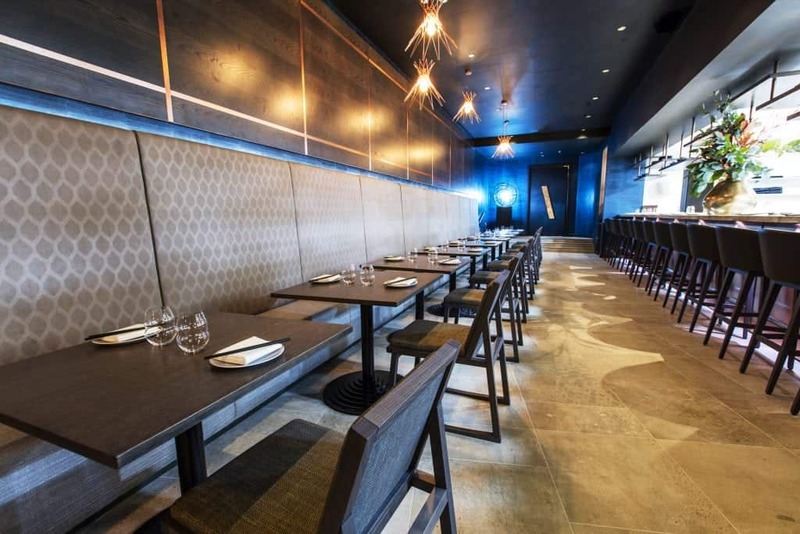 Like the Threadneedle space, the newer restaurant is also split into a “GRILL” and “RAW” section. The former focuses heavily on steaks from across the world (unsurprisingly given Williams’ history), while the latter prides itself on a selection of tartars, remarkable sashimi and more. What’s more, as of October this year the whole Raw menu is 100 per cent gluten-free, and though I visited the restaurant in its original incarnation when it first opened (and very much enjoyed the experience), I had to return to find out whether the new menu was anywhere near as exciting, and generally tolerable, as beforehand. Following a couple of well-made (probably not lunch appropriate) cocktails, my companion ordered the ham hock tortellini (£12.50) from the restaurant’s ‘Grill’ menu, a large, slightly over thick pasta shell was filled with slow-cooked ham hock, served alongside decadent white truffle cream and a complimenting emulsion of pecorino cheese. In addition, some roasted baby vine tomatoes were tasty though somewhat discordant with the rest of the dish. Next, from the gluten-free menu – although not actually ‘Raw’ as the restaurant name might suggest – a protein bowl (£18.50) offered a slab of sirloin steak so lean it could have been passed as expensive fillet. 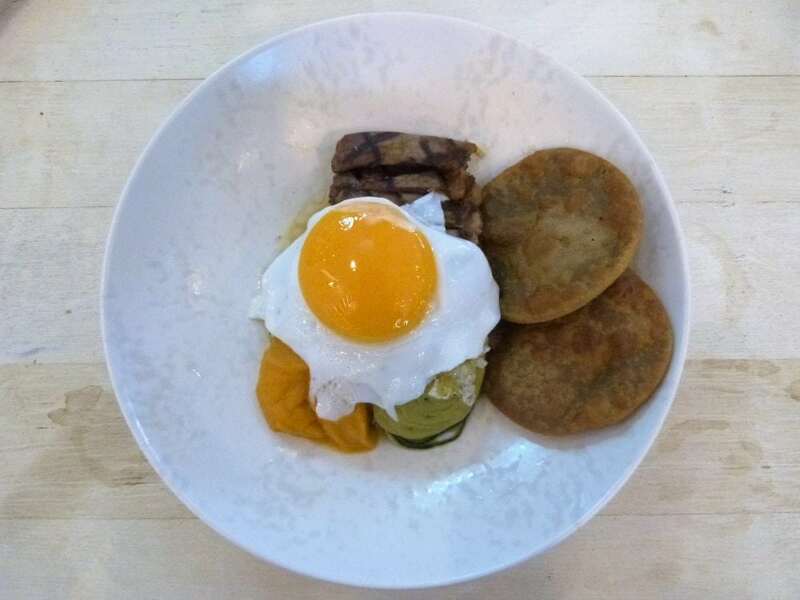 What’s more, the steak was cooked exceptionally well and served with a fried egg that had a perfectly formed yolk, acting like an unnecessary sauce for the beef. This was served atop a scoop of earthy avocado puree and laces of courgette spaghetti to lend a real healthy leaning to the dish. Two crispy tacos made from buckwheat, were also incorporated to add another depth of texture, in contrast to the egg, avocado and rare beef. A dish of tempura prawns (£11) used black rice flour for the batter, incidentally making the prawns look as though they’d been prematurely slapped onto a flaming barbecue. Conversely, the plump prawns were cooked remarkably well, though the skin had not been removed before being coated with the tempura batter. This left us with two options: to remove the skin ourselves, as well as the coating batter, thus completely negating the point of the dish, or to eat the shell with its less than pleasant, throat-tickling texture. A shame given that the taste of the delicate seafood worked remarkably well with the accompanying smoked garlic aioli. Elsewhere, M’s riff on a classic Bento Box (£17) arrived at the table in an actual wooden box, split into compartments for each of the treats included. Edamame pods were joined by a Japanese chicken curry atop translucent rice noodles, which should be eaten first as the box’s poor thermal mass allows the food to cool down quickly. In addition, strips of salmon sashimi served at body-temperature were of an optimum thickness, though it is the gluten-free bao bun filled with slowly braised pork belly with decent spicing and pickled cucumber to cut through the pork fat that was the best thing eaten during our lunch. M RAW’s new gluten-free menu is not without minor faults, but as well as serving a quick lunch in less than an hour, against all adds, M achieves the seemingly impossible – serving gluten-free food that’s genuinely flavoursome and mostly very enjoyable. M RAW can be found at 3 Zig Zag Building, 70 Victoria Street, London, SW1E 6SQ.